Really, in practice almost no West-European Catholic observes Lent. This will not be different in a mondaine sea resort floating on a bubble of unimagineable luxury with the own citizens completely outnumbered by 1 to 6 foreigners, not even counting the tourists. Caritas is best done in all discretion. I like it when I hear an anonymous donor gave something than counting the left-over after the costs for the Salle des Étoiles, the catering and the whole rambam. She is no Sovereign Princess but just the wife of. She has no institutional obligations except just being the wife of. So was Princess Grace, and that never stopped her from standing along side P. Ranier all the time, supporting him and teaming up with him. She involved herself in the principality's life, she created multiple associations and events, she work hard as hell. Maybe the difference is that P. Grace seemed to genuineally love the principality and her husband and family while Charlene seems to be living a burdeon. She looks always bored And as the wife of a rulling prince YES! SHE AS OBLIGATIONS!!! Take a look at Letizia, Maxima or Mary... Why should Madame Charlene be any different???? Actually Grace was often bored as hell in the village which was Monte-Carlo. She was a cosmopolitan and saw in the Rose Ball an opportunity to be glamorous once again, posing with her Hollywood pals. It had little to do with "love for Monaco". That sugarcake fondant is already cracked by what we know about the real life of Grace. She was also an American, a Hollywood actress, she was known with the concept of rolling oneself in luxury with charity as a good excuse. In my personal opinion Charlène is too down to earth, too grounded and too pure to fiddle around in this world of ultimate shallowness. She is a girl from Bulawayo, Zimbabwe. While others dreamt of photoshoots, she made miles and miles in chlorine water. This sort of events are the natural habitat of a Donna Beatrice. The Princess however, looks like a lady to me, no more happy than just being home with little Jacques and Gabriella. And remember: it was just a ball in a sport club building. The Maison Princier was represented. By no one else than monseigneur le Prince in very own person. I am sorry but it is ignorant to say western Catholics don't observe lent. Many do, giving up something for the period like caffeine or sweets. Certainly giving up all luxuries is not common, but observing lent in some way is not forgotten That is not to say for a moment I think that is why Charlene is not in attendance at the event. I also agree with those who say this is a major event. It might not be a 'national' event like Devotee, but it is certainly like the Circus, one of the key events of the year for the royal family. It certainly gets a lot of press which when it comes to such a small country is important for their charities. Just because it is Caroline's patronage, doesn't mean it is something that the whole family shouldn't attend. Or at least senior members. Countessmeout, maybe it is like that in Canada. In european catholic countries it is rare to observe Lent nowadays and you shouldn't call ignorant the person who said so because she is absolutely right. Religious people may not eat flesh on fridays but usually that's all. I've never heard of anyone who ever gave up a dance because of Lent in my whole life. Not even very religious or old people. Actually, in Spain plenty of other big religious festivities take place during Lent. And there is dancing, and drinking and singing, and everything you want. About Charlene, I don't think the clue is whether the ball is a major or minor event. It's not a morning or afternoon event. It's really weird not to accompany your husband/wife to a dinner or ball that takes place a few steps away from your home. I am sure her absence means something. Believe me, France is one of the most secularized countries. I have a house in Maussane-les-Alpilles, Provence, north of Marseille. In this country where laïcité is a dogma of the Republic, catholic life is very much irrelevant, I can assure you. The casino in Monte-Carlo will not have one customer less because it is Lent... When you would not know, you would never guess it is. When a lady marries an aristocrat but prefers a more private life than being the belle of the ball, then this is a legitime choice. In every monarchy the head of state and the consort have partly separate agendas. Even in Spain where the duo Felipetizia seem glued to each other, they have separate arrangements indeed. Did I say dance or parties? Do you speak for every catholic person in Europe? I highly doubt it. What you choose to give up for lent is a personal choice. I have known people, including in Europe where I have lived thanks, who have given up television for instance. It is simply meant to be something that means something to you. The old tradition of it being fats and sweets (fat Tuesday) has adapted with time. So yes, to claim that all Catholics in the western world don't observe lent is ignorant. It would surprise me when Charlène, whom had no Catholic upbringing, would follow a Catholic tradition which is hardly observed anymore. But okay: if she does, she deserves respect for doing so. I am a Catholic myself, but as I am already sharp on good food, do not smoke, do not drink without social reason, I do little else than sticking to fish on Fridays, but that is also the custom outside Lent anyway. I doubt Lent plays any role in the non-attendance at the ball. Charlene may well hate balls and galas - funny decision she made marrying a Prince if that's the case. Who says charity is best done with discretion? Many people want to get dressed up, eat good food and have fun - if they're prepared to pay their money to do so AND also raise money for charity why shouldn't they? I find the assumption that the charity is just an excuse a bit smug and patronising. Not to mention the sniffy comment about Princess Grace being American. The charitable organisation will take the money whether it's given anonymously or not. It doesn't buy more just because somebody didn't give it publicly. Grace may well have been bored as hell - most people have periods in their lives where they get bored. So what did she do? She got off her bum and did stuff - charities, events, gardening, art, she carved a little cultural niche for herself towards the end of her life. She may not always have loved Monaco but she made an effort to be a part of it and they certainly loved her in the end. At least she was in the Principality for decent lengths of time, even when she was based in Paris with Caroline and Stephanie. Yeah, no. I think some jobs require you to soldier on and do things and be out there whether you´d rather do them or not. Unless you´re experiencing some extreme medical condition, then you`re expected to stay at home, otherwise, you go out there and play nice. I`m in the diplomatic field, Ambassadors and other foreign service officers attend the dullest, most boring/glamorous/sometimes irrelevant events because it`s expected. Most of these people are a provincial, introverted, humble lot but attending events is a way to make contacts that eventually help build your niche in your career that could ultimately assist in promoting your country. The Consort of Monaco is the top 2 diplomat of her country, ideally. I honestly don`t think there`s any excuse. But what do I know. The bal de la rose is not a state event , it is an event made for the rich people , which was made by the director of the SBM to attrack the rich people in 1954, after 1975 the raised money was for the princess grace foundation which was just begining. Of course Princess Grace was president of the bal , at her death, Prince Rainier gave the princess Grace foundation to Caroline, Albert is the vice president, Caroline became president of the bal de la rose as the prince Albert. it is why Albert is present to the bal de la rose. I prefer to see Charlene present to the Sainte Devote cérémonies, the processions of the ' vendredi saint and fe la fete Dieu, last year, she was alone at the procession while Albert was present to the Cowes regates. to the visit to the handicaped people who attend the grand prix or to the visit to the school for Young children as she did 2 weeks ago. We don't need to read her events thread - we know what she did. And comments were made. How do you know what she prefers? Did she tell you? The fact is she was very present in the life of the Principality right up until she had the twins, had some maternity leave and returned to duties. There has been a very evident reduction in the number of public appearances since last summer. The visit to the school was 3 and a half weeks ago not 2. It's weird. And that's my opinion. Lent is very much still observed in the Catholic Church but usually by giving up something you like such as sweet food or drink. Etc. I find weird Princess Charlene absences in many duties with Prince Albert, as well as her absence at Pierre and Andrea's wedding. As far as the Bal de la Rose is concerned I personally think Princess Charlene left the limelight to her sister in Law Princess Caroline "Who stepped into her mother shoes" as Prince Rainier said years ago. The reason is mainly that Princess Caroline is the Princess Grace foundation Patron and She attend the Ball along with his Brother and her Family, as well as Princess Charlene left the limelight to Princess Stefanie and her family for all it is concerned about the Circus Festival. As simple as that. Truth be told, I could care less if Charlene showed up or not. I've avoided any thred about her and Pr. Albert for a long time now. If she shows, she's criticized for the dress she wore, the color she wore, her hair, all being appropriate, to flashy, to blah. if she does not show, it's because she'd rather be with the kids, she wants a divorce, she's unhappy with her choice in life, blah blah blah. I take it in stride. sure, she should have shown up to the ball. but it was just "another" event which she chose to support her husband. For whatever reason, no one knows. I hate the speculation. I just came to look at the attendees and enjoy the pictures that we get, not speculate the reasons why she chose to do what she did. Pr. Caroline: for some odd reason, I "think" I like her dress. And as for the little one, her name is slipping my mind right now, age appropriate, but the dress confuses me with that black strip above her bust line. not very flattering. and was that the actual dress or was it an over coat and the actual "dress" underneath?? it was nice to see her there. 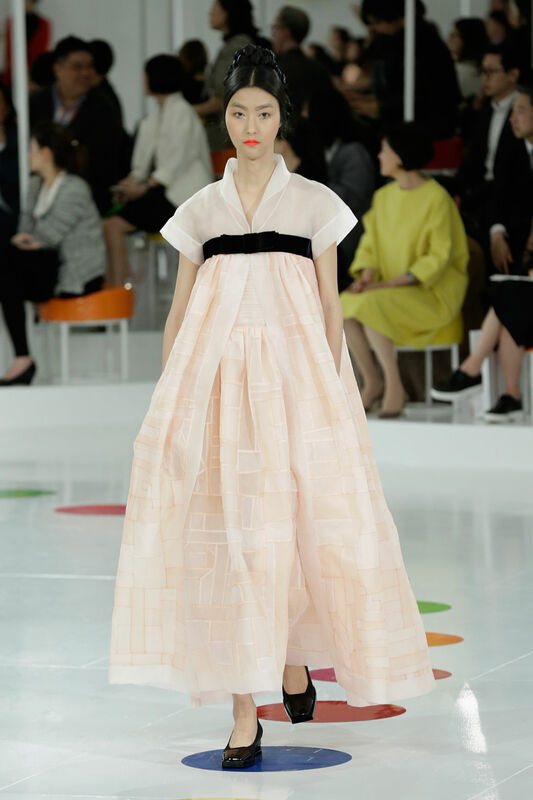 ^I think Alexandra wore a Chanel costume and it was inspired by Korean (?) costumes? That's why the belt is so high. To me, it is not odd to perform separate royal duties as a couple. What IS odd to me however, is for one spouse to be absent at events, while duties, are galas, where one naturally brings a date. This would include weddings, balls, etc. I've seen several arguments floated - she wants to be a mother first and foremost. Fair enough, but she hardly has such a grueling schedules that she can't take an evening away (especially considering the nannies and the fact they are likely in bed by 7-7:30 pm), or that she dislikes balls - she's the wife of a reigning prince and they hold TWO balls a year, I think she can deal with that and in fact has an obligation to do so. If you don't show up at the wedding of your husband's nephew and you don't show up at a ball if your sister-in-law and her family are also in attendance, it can only mean one thing to me; there's a rift. Why, who caused it, I don't know. However, the rift seems clear as day to me. I think you could be right I don't think Caroline would be a warm and fuzzy sister in law which of course is just MO. Sometimes there is no going back after a family upset which is very sad. They did all seem happy about the twins but thats not saying they all get on. AFAIK she did attend the civil weddings of both Andrea and Pierre. She returned to Monaco for some events in order to allow P Albert to stay for Andrea's religious wedding in Switserland. Neither she nor P Albert attended Pierre's religious wedding, if I remember correctly. I will be surprised if there are bad vibes between the family members. And if that is the case I feel sorry for P Albert, since he will be in the middle of it.